New Jersey Truck Accident Lawyer | Tomes & Hanratty P.C. Trucking accidents on the New Jersey Turnpike and elsewhere throughout New Jersey may involve serious injury, even fatality, because trucks are far bigger and heavier than the cars they hit. 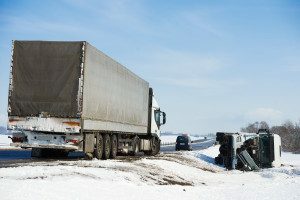 Most trucking accidents are entirely preventable if only the trucker or the trucking company has followed the federal trucking rules and regulations. If you are injured in a truck accident, the results can be devastating. You could suffer from serious injuries that can impact your life and livelihood. If you need effective representation from an experienced law firm, contact Tomes & Hanratty, P.C. for a consultation. Exhaustion is a major factor seen in many accidents involving truck drivers who are trying to get to their destination without stopping to sleep. There are rules governing the amount of time that a trucker may spend on the road each day. Truckers who violate these rules and falsify their trucking logs to make deliveries faster are putting themselves and other drivers at risk. Trucking companies who pressure truckers to make time are also contributing to dangerous conditions. Companies that fail to properly and regularly maintain their vehicles leave doors open for brake malfunction and other problems. Even the way a load is balanced or the weight of a load can play a role in a crash with a truck. These and other causes of trucking accidents injure and kill far too many innocent motorists each year. If you have suffered a serious injury from a truck accident, a car accident or any other accident, Tomes & Hanratty, P.C. is here to help you seek a recovery that is full, fair, and the maximum allowed under personal injury law. Our New Jersey truck accident attorneys are known throughout the state for our aggressive and relentless pursuit of justice for accident victims. Was the truck driver qualified to drive? Can, by reason of experience, training, or both, safely operate the type of commercial motor vehicle he/she drives. Have a currently valid commercial motor vehicle operator’s license issued only by one state or jurisdiction. Have successfully completed a driver’s road test and has been issued a certificate of driver’s rod test in accordance with corollary 391.31, or has presented an operator’s license or a certificate of road test which the motor carrier that employs him/her has accepted as equivalent to a road test in accordance with corollary 391.33. We have decades of experience helping injured people recover compensation so that they can stabilize their lives and move forward again. Our founder, Frances Tomes, is a member of the Board of Governors of the New Jersey Association of Justice and of the Bad Faith Committee of the New Jersey Association for Justice. Her experiences in these positions allow her to fight for justice for victims on every level. She was named by the New Jersey Supreme Court as a Certified Civil Trial Lawyer, a designation that is earned only after years of experience in courtrooms and at negotiating tables. Our law firm is dedicated to investigating the cause of your accident in full and obtaining the compensation you are entitled to for your injuries. If you were injured in a trucking collision, contact Tomes & Hanratty, P.C. today to schedule a free, initial consultation.